After the disappointment of pulling out of Pays d'Aix 70.3 four weeks earlier, I set out for my second European race of the 2015 season. It is always a hard decision to pull out of a race and to know when you should push on and when to stop. For me, I felt that it was important to have a wider perspective and leave some in the tank to reach my major goals for the season. After one week of complete rest and a 3 week block of tweaking my training schedule with my coach Neal Henderson of Apex Coaching, I started to get back on track. This would not have been possible without the amazing support of my network in Girona which consists of CENIT (nutrition, osteo/physio), the FISIO-CENTER (massage, kinesio taping) and VeloLoveFit (bike fit). The pieces fell into place a week before Challenge Salou but, to be completely honest, I was quite nervous leading into this race. I knew that I was fit but there was still the uncertainty of whether my calf would hold up under the stress of racing and I was unsure if I was even going to be able to race until a few days before. The swim was a beach start with shallow waters and a lot of dolphin diving was required. This was not ideal for someone with a calf issue. I started very timidly and by the time we started swimming I was further back than I wanted to be. I swam strongly and gradually made my way back to the front of the race to exit right in the mix. I had a good transition and started the bike in 4th position. I quickly made my way to the front of the race by kilometer three. I then surged to break clear of the group that I had no intention of getting caught up in. I like to race a certain way and to dictate the race as much as I can. I have been advised many times to maybe hold back a little on the bike so I might run better. I disagree. Riding easier opens the door for the weaker swimmers to catch up and the weaker riders to save their run legs. This is not how I race. I want to know that when we all get off the bike, no one is feeling good. I can only control one aspect of this and it is a real shame that the refereeing is abysmal these days. I am sick and tired of hearing post race about athletes "sitting too close" and "saving themselves" on the bike. If that is how they want to race then they should go back to ITU or not bother racing at all as winning like this must not feel that great anyway! My new Wattie Ink custom Contender Tri Speedsuit in my new team colors and design was fantastic. It was very comfortable and aerodynamic. I have never matched so well with my bike too! I came off the bike 4:30 in front of the group and stuck to my plan of building my pace on the run as I gained confidence that my calf would hold up to the task. Through half way, I was holding 3:30 per kilometer and my lead to Ritchie Nicholls was down to 75 seconds. I definitely doubted that I could hold on for the win at this point but stuck to my plan and picked up the pace slightly. Through the next 5km lap, Ritchie did not gain as much time and I still had 40 seconds lead. I was in with a chance. My calf felt good so I went full gas and full stride. With 3km to go, I still had 35 seconds and was on my limit but holding strong. The rubber band snapped at the final turn around with 2km to go and I went on to win by just over a minute. The relief, excitement and the underlying feeling of knowing that I can go to that place of pain again in a race was amazing. Winning in front of my amazing wife, Sage, who was standing alongside my lifelong supportive mother, is something that I will never forget. 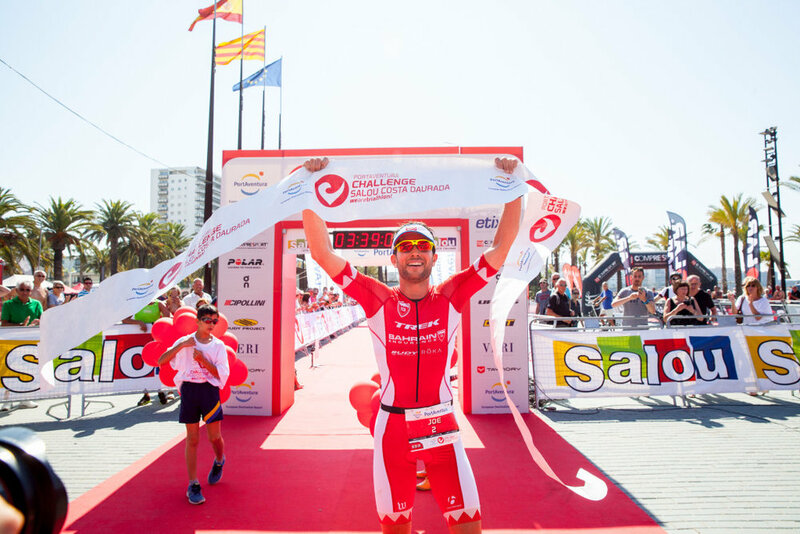 Thank you to the Challenge Salou race organizers and to my amazing sponsors, Trek, Bahrain Endurance 13, Rudy Project, Roka, Bontrager and ISM.